I will never forget meeting Basil. A gentleman in all manners. I spotted him in deep concentration looking at a machine that is very close to my heart. The bike is called Mina. An attention to detail tribute to my mother who passed away, well, a long time ago. I think of her daily as an inspiration to all good things. My mother was aware of my entrepreneurial skill when I was about 6…and I now realize I was to follow in her footsteps. Mina was a pioneer woman actively involved as a real-estate brokerage opposed to the more traditional “sales MAN” of her time. Eventually she succeeded in owning her own real estate agency. This all happened where I tried to grow up in suburban Glen Ellyn, Illinois. Ah the 70’s. I built this tribute bike in her honor in 2008. The Time Machine logo that appears on the tank is also her inspiration to my video website I started in 2008… Called the TIME MACHINE. Back to Basil looking in awe at the bike. When I approached him smiling, I told him the story and asked him if he wanted to hear it run, a few kicks and the 61 incher is idling perfectly. I’m always stoked and proud of the old 1946 knuckle I call Mina. I think it was about then that he smiled and asked me if I would/could build one like it for him. I had already decided that I would and then he gave me his speech. It went like this… Basil explained that his father indeed was close to his heart and somewhere in the conversation he called him Mr. Lucky. And that’s when it was decided the bike would also be called affectionately MR. LUCKY! I tore into this project with a whirlwind of ideas and organization. Back up! When I told Basil I could/would build a bike, I told him it would NOT be a knucklehead. Back up! About 10 years ago I bought a polished 55 pan motor from Patty Kramer in Oley, PA. It just looked SPECIAL!!! Back up!! Patty tells me this story how Basil tried to buy THAT same motor for 25 years. Half of its 60 year life… it just been sitting around, till now. Now its Mr. Lucky forever! Back to the build- the motor was pretty easy. I re-polished all the parts inside and out, bored the original cylinders, I used replacement heads sold by V-Twin with the 54 and earlier plumber style intake– I just like them better than the 55-65 jobs. All stock motor. Polished transmission I had built back in 2005 likely. V-Twin 1955-1957 straight leg frame. Stock springer forks, and the rest is a combination of parts from many years of HD history and dozens of dozens of hand built components that define what I call REAL SCHOOL mechanics. And some great gadgets. The double ride control, the right side adjustable baffled duel exhaust. Dual acting front/rear right hand brake lever… The new old stock pile got somewhat depleted with the 65 panhead rear left crossover dual exhaust that blended to these unusual upswept trumpets, capped with my pal Ken Curtis’ exotic baffle arrangement. I want to stop right here and tell you I had a lot of fun doing this one. The overall layout is LOW with LOW and wide double layered custom Tom Faber built bars. These bars resemble the bars on the Mina bike, which is another book. The bike handled so easy with the wide and low. The other look I wanted was to have a lot going on in the headlight area and also something to compliment that on the rear. What better than CHROME. Load it up and put it on!!! In some style!! Now the paint, Painter John Dills really put in work to do this job, there was a lot of moving parts and changes in a short period of time, starting with the wheel hubs. When all of that is in various stages of completion, our pal Mark Peters is busy stripping the multi layered paint. Nerves of steel. The paint started with off white with some design with detail white on fork /bars/rockers and about a dozen other parts. Then it happened… I was mocking up the look on day 1 or 2 and reached for a pair of tanks close by. They were green with odd paint. A pair!!!!! The realization of two things. One was they were a pair all right, but not matched, BOTH the right side, odd. 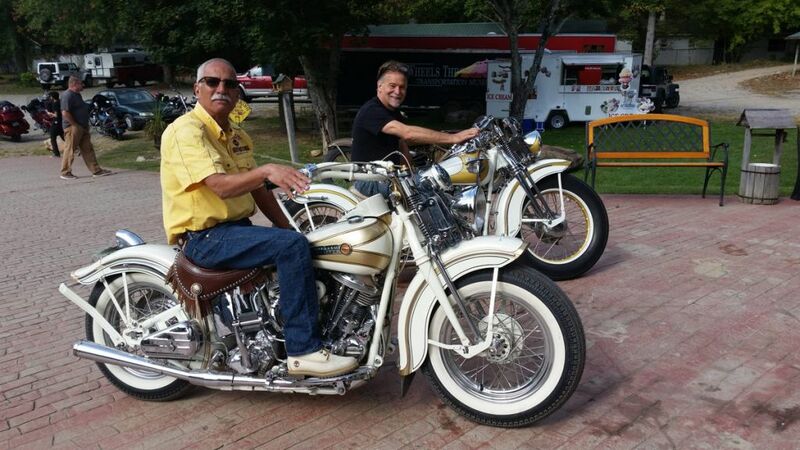 One was flathead 74 and the other panhead odder, WHAT! What’s the story!? They were painted a long time ago. (Notice dirt dauber nest). The second thing I realized is that I now have the paint scheme that I was unsure of. Time for John to do his magic…The period graphix work well with the two tone and the white. Well anyhow, I like it. Paint done (well almost), chrome on. Ready to run, Damn, this bike started and ran as well as any I have built. FROM THE FIRST STROKE. Proud moment. Then I opened the baffle! No words! Ask Buzz- he was there. Down the road, works great…Then the dreaded thought, “ITS NOT MINE”.